An American football quarterback Trevor Siemian currently plays for the Minnesota Vikings of the National Football League (NFL). He played college football at Northwestern. In the 2015 NFL Draft, Siemian was drafted by Denver Broncos in the seventh round. After Broncos' Super Bowl 50 victory over the Carolina Panthers, Siemian earned a Super Bowl ring as a backup. Siemian is in a relationship with his long-term girlfriend Bo Podkopacz. Trevor Siemian was born on 26th December 1991, in Danbury, Connecticut, United States. His parents are father Walter Siemian and mother Colleen Siemian. He grew up along with his brother Todd Siemian. Simian belongs to an American nationality. Siemian attended Olympia High School in Orlando, Florida and later joined Northwestern University (NU) for his higher studies. He graduated in Communication Studies. Trevor Siemian played college football for Northwestern University and was awarded two Academic All-Big Ten honors in 2013 and 2014 respectively. 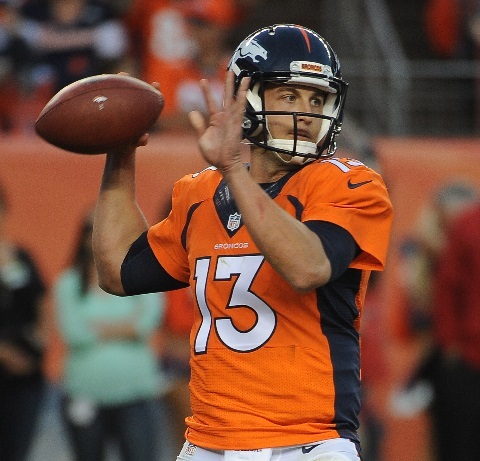 Siemian averaged 16 of 26 passes for 256 yards and three touchdowns in eight games. He played all 12 games in 2013 and further made his second and third career starts. In the 2015 NFL Draft, Siemian was ranked the 22nd best quarterback by NFLDraftScout.com. Siemian was drafted by Denver Broncos with 250th overall pick. He played only a single match in the 2015 season and missed other matches due to a knee injury. Siemian was also the part of the Broncos team when they won Super Bowl 50 over the Carolina Panthers. After his teammate, Peyton Manning retired and Brock Osweiler signed with Houston Texans, Siemian was selected as the starting quarterback for the 2016 season by the coach. Siemian became the first quarterback in NFL history to throw 300 yards and complete 4 touchdowns with no interceptions on 25th September 2016. He played for Broncos until 2017 and was traded to Minnesota Vikings on 19th March 2018. Trevor Siemian is currently dating his long-term girlfriend Bo Podkopacz who is a former Northwestern soccer player. His girlfriend Bo was a three-time All-Big Ten academic team performer. Siemian and Bo began dating since their school days. On 27th February 2018, the couple got engaged. 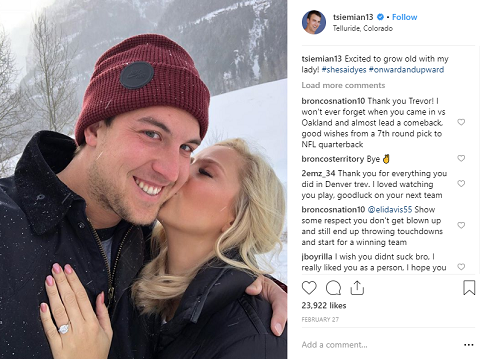 Siemian shared an adorable photo with his partner on Instagram showing off an engagement ring. The pair is successfully maintaining their relationship. Both of them share photos of each other on their social accounts. Although the pair is already engaged, neither Siemian nor Bo has mentioned any plans of getting married. Besides this, there are no any records of Siemian's other affairs and relationships. Trevor Siemian aged 26, the handsome hunk stands the perfect height of 1.91 m i.e. 6 feet 3 inches tall and weighs 100 kg which is 220 lbs. Trevor Siemian earns a fortunate amount of money from his professional football career. As of 2018, the estimated net worth of Siemian is around $1.5 million. 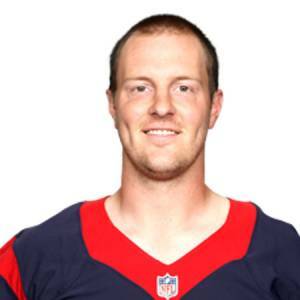 He previously played for Denver Broncos of NFL as their quarterback. Siemian signed a four-year contract with Broncos for $2,332,783 in with signing bonus $52,783 in 2015. The contract included an annual salary of $583,196 and the base salary of $1,907,000. In addition, Siemian further earned money from his college football career.